Deep Learning has swept through the IT industry, bringing benefits and better classifications to a number of applications. Inspired by the way the human brain works, the technology uses a layered learning process to enable the computer to classify, store and access data, which it can then refer to for learning. This means it can use a whole image for recognition, rather than relying on separate elements of that image. This is a cumulative process – the more elements it has to draw on, the better the classification – thus, the better the ‘learning’. The benefits of this technology for face recognition and image classification makes it valuable in the field of security. It touches on every aspect of the security industry – from facial and vehicle detection to behaviour analysis. This, in turn, starts to change the focus of security from being reactive to being able to predict problems before they happen. Hikvision has used this technology and created a family of products to maximise its use. The DeepInview IP camera range and the DeepInmind NVR range work together to provide all the power and benefits of Deep Learning. While the cameras provide the smart ‘eyes’ of the system, the NVR represents the analytic and storage capabilities of the brain. The products help to tackle security on two fronts – recognition, monitoring and counting of people, and recognition and detection of vehicles. This uses Deep Learning technology at its most effective, for its ability to classify and recognise thousands of features. Obviously, this multi-layered approach uses a lot of memory and CPU performance, which is one of the reasons the technology has become more widespread in the past few years. To put this into perspective, in the first stages of the technology, it took 1000 devices with 16 000 CPUs to simulate a neural network. Now, just a few GPUs are needed. 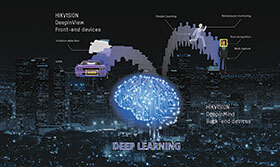 Hikvision is partnering with the largest of the chipset brands – Intel and NVIDIA – to explore the possibilities of Deep Learning for the surveillance industry. Hikvision’s innovation also facilitates and improves on this – the H.265+ codec radically reduces transmission bandwidth and data storage capacity requirements. This means there’s no loss of quality, even though the data being shared and stored is exponentially higher. Applications are numerous. The technology could enable the system to provide a black list/white list alarm, for example, which could come in very handy in access control scenarios. It could also be used to recognise unusual behaviour – possibly allowing security staff to prevent an issue if people are found loitering, for example. The new premium range of products will further extend the quality and capabilities of security systems. They will also allow security professionals to start planning to avoid issues, rather than reacting to them. This could be the next evolution of the whole industry – using AI to change the world. For more information see How Deep Learning Benefits the Security Industry at www.hikvision.com/en/Press-Release-details_74_i1515.html (short URL: securitysa.com/*hv74). For more information contact Hikvision South Africa, +27 (0)10 035 1172, support.africa@hikvision.com, www.hikvision.com.